The most important thing in the kitchen after the cooking pots are the knives. You can control the recipes, amounts and ingredients suing your knives. Even chefs cannot work without their own knives. So, let’s have a look on some great tips that will help you extend the life of your knives. A clean, dry knife will last longer and perform better, ensure that your knife is clean all the time to avoid any bacteria on it. It’s important to keep it dry as well to prevent it from getting rusty. 2-Never keep your knife in a leather sheath for long-term storage. 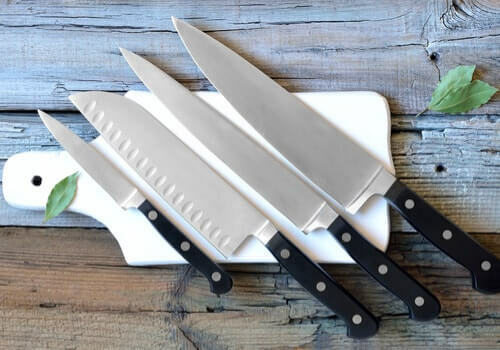 It’s always recommended to avoid storing your knives outside leather covers because leather’s oils can cause the knife to rust over time. This usually happen when you buy a new knife and keep it in its original leather package. This is most likely to be done with garlic. Cut the garlic into small pieces, then with the side of the knife press on these small pieces till its minced. This will allow the garlic to be cooked faster and give a taste to your recipe. Most knives are sharp on the backend of the blade. That’s because we always use the front part to cut almost everything, and that’s why it lost its sharpness. Use the backend of the blade while cutting food that’s tougher to cut. 5-Use the right tool for the right job. If you’re using the knife as a slicer do not use it to chop. Chopping food using the normal knife will make it lose its sharpness, and it might even break if it’s not strong enough. Share now with us your techniques to lengthen the lifespan of your knife.